Here’s the full Mass Hands article, focusing on me as a homebrewer. The project overall is meant to be an interactive/new media exploration of handcrafted work that still thrives in Massachusetts. I’ve been falling behind a bit on my homebrewing (it seems that life’s been getting in the way), but I’m finally back on track. And to celebrate, I just brewed a blood orange hefeweizen. I had the impetus to make one late last spring, until I discovered that I had already missed blood orange season (It’s a shame that the season for something so delicious only lasts for 2 months in the winter). The recipe was an adaptation of a Honey Wheat Ale kit from Barleycorn’s Craft Brew in Natick, combined with a friend’s suggestion for the blood oranges. 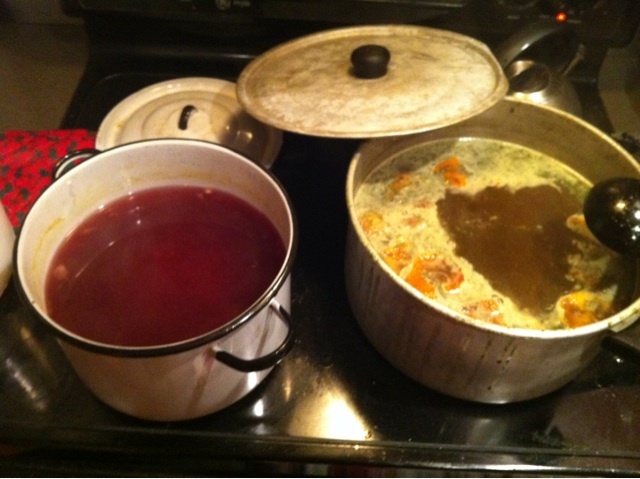 Yes — that’s a pot full of blood orange juice on the left. AWESOME. This was my first time visiting Barleycorn’s, and they were fantastic — much better than the arrogant beersnobs that run Modern Homebrew in Cambridge (Imagine Comic Book Guy from The Simpsons. Now imagine he runs a homebrew store instead. “Extract brew? Ugh. Why don’t you just like, sparge at 275 Fahrenheit?” I HATE YOU). If you’re looking to get into homebrewing (and have access to a car), I suggest you check them out.